Dragon Ball Z: Legendary Super Warriors (ドラゴンボールZ 伝説の超戦士たち Doragon Bōru Zetto Densetsu no Chô Senshi Tachi?) is a turn-based fighting game released for the Game Boy Color. It is played with the use of in-game cards for attacks, techniques and support items. The game’s story takes place from the start of Dragon Ball Z, the Saiyan Saga, and runs until the end of the Buu Saga. The game also includes two extra stories involving Future Trunks's timeline. 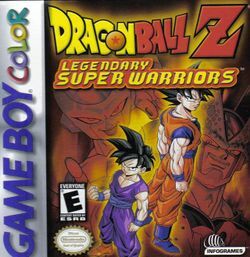 The game boasts a large array of characters for a Game Boy Color game, featuring all of the Ginyu Force, Super Saiyan forms of all characters that reach it, as well as the fusion characters Vegito and Gotenks. Once the game has been completed, the player is free to replay the story mode or battle modes the game has with the freedom to use any characters and forms they choose in any of the given battles. During the player's second playthrough, they may be able to unlock additional characters if certain criteria is met. This page was last edited on 28 November 2015, at 14:36.